Attention Editors: For high-resolution images to accompany this release, click image1, image2, image3. Montgomery College will present two acclaimed musicals at its annual Summer Dinner Theatre, now in its 38th season. A Funny Thing Happened On The Way To The Forum opens June 19. 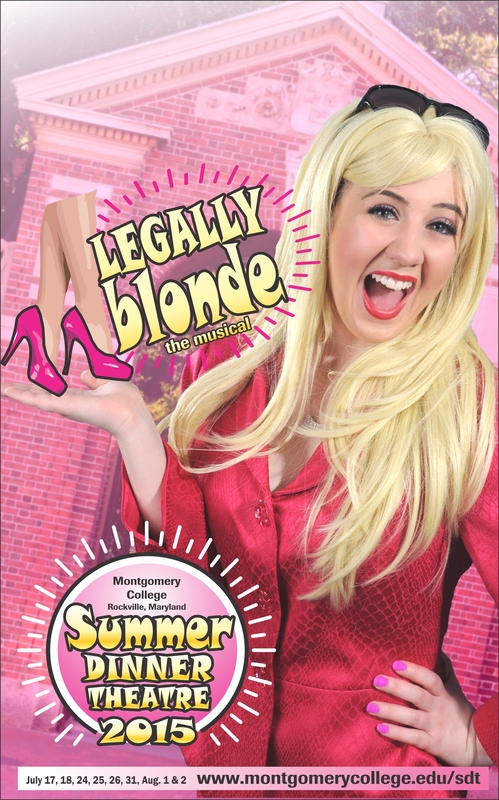 Legally Blonde The Musical opens July 17. In Legally Blonde The Musical (book by Heather Hatch, music and lyrics by Laurence O’Keefe and Nell Benjamin) college student Elle Woods appears to have it all until her boyfriend dumps her so he can start getting serious about his life and attend Harvard Law School. Determined to get him back, Elle uses her charm to get into the school herself. There, she quickly realizes her potential and sets out to prove herself to the world. The play is based on the novel by Amanda Brown and the Metro-Goldwyn-Mayer motion picture. Montgomery College’s Summer Dinner Theatre provides training to aspiring musical theatre performers and behind-the-scenes artists who apply or audition for positions. Performers include Montgomery College students, visiting students from universities, high school students and members of the community. Participants enroll at Montgomery College for 10 weeks of hands-on education in everything from performance to costumes and lighting. During shows, the performers are accompanied by a live orchestra. The artistic director is Pauline Grossman. An accomplished choreographer and drama teacher, her credits include more than 35 musicals throughout the DC region. Pauline is a resident faculty member at The Catholic University of America, the Joy of Motion Dance Center and the Musical Theater Center of Rockville. Lisa Carrier Baker is the general manager and music supervisor. A professor of voice at American University and Montgomery College, her students can be heard on Broadway stages and in national tours and include Helen Hayes award winners. Previously, she was director of education and ensembles at the Musical Theatre Center (now Adventure Theatre MTC). In addition with the help of Bernadette Peters and Broadway Cares producer Scott Stevens, she founded DC Actors for Animals. Walter Ware III is the director of A Funny Thing Happened On The Way To The Forum. He is the resident casting director and artistic coordinator for Signature Theatre where he also serves as the director and producer for all the cabaret programming. Ware returns to the program having been a student directing Intern in 2011. Mark Minnick is the director of Legally Blonde The Musical. He has been honored with the Helen Hayes Award for Outstanding Choreography for Monty Python’s Spamalot and nominated for outstanding choreography for numerous productions. This year, for the first time, tickets may be purchased for show only during some performances. To purchase tickets or to get more information on shows, seating, the dinner buffet and directions, visit http://cms.montgomerycollege.edu/edu/department2.aspx?id=5103 or call 240-567-7676. Legally Blonde The Musical is presented through special arrangement with Music Theatre International (MTI). All authorized performance materials are also supplied by MTI. 421 West 54th Street, New York, NY 10019 Phone: 212-541-4684, Fax: 212-397-4684. Find more information at www.MTIShows.com.